Website and Facebook ads for Ristorante, the frozen pizza brand, have been banned after it emerged the claim that nine out of ten people rated their product the best had come from people who had already bought the product. The ad, seen on 11 March, featured an image of a pizza alongside the claim "Best Pizzeria Taste at home. 9 out of 10 agree". Two Sisters Food Group, the owners of rival Goodfella’s Pizza, complained to the Advertising Standards Authority about whether the "9 out of 10" claims could be substantiated. Dr Oetker UK, the Ristorante brand owner, said the survey had polled 58,037 respondents, 90.81% of whom strongly agreed with the statement, "Ristorante has the best pizzeria taste of any pizza I have purchased to cook at home." However, to participate in the survey, participants had to have first purchased a special Ristorante pizza promotional pack. The company said it was made clear to participants that a free pizza was available to anyone who completed the survey, regardless of whether they agreed with the statement or not. Dr Oetker said they had no intention of misleading consumers and had undertaken an extensive due diligence process prior to advertising, including seeking advice from the Institute of Promotional Marketing on whether the headline claim accurately reflected the survey data. But the ASA concluded the claim was likely to mislead given that the "9 out of 10" claim suggested 90% of a group representative of the general public thought Ristorante was the best. The watchdog ruled: "The ads must not appear again in their current form. 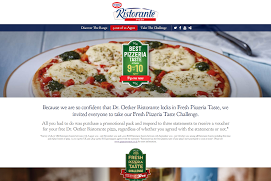 We told Dr Oetker (UK) Ltd not to imply that 90% of a group that was representative of the general public and who were in a position to compare Ristorante pizza with competitor products had agreed that Ristorante had the best taste, if that was not the case."